God’s Wish can never be a coincidence! An understanding between Panditji & Lord Venkatachalapathi! This strange incident happened in the eighties. Two people from Malaysia who had booked an appointment with Panditji through a local person arrived to meet him. 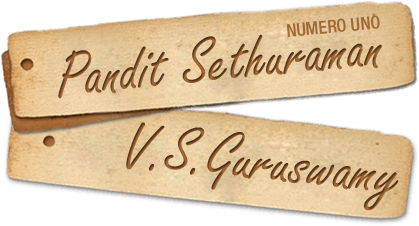 The Numerology Consultation, started at 10 A.M., concluded only at 2 P.M.
After this, panditji inquired about their further plans in Madras. To this, they replied saying that they had come only for a one day visit to consult Panditji and that they had planned on making a quick visit to Tirupati if the consultation got over by 1 pm. They had to be at the airport by 8.30 A.M the next morning for their flight. As the time was 2 P.M already, they thought that getting back to madras on time would be difficult and gave up on the idea of going to Tirupati. Panditji, listening to this, suggested a different plan to their surprise. He told them to have a nice lunch, rest for 3 hours, pack their luggage and then to start for Tirupati by 6 P.M. He asked them to stand in the queue separately leaving a gap of 20 people between each other, have darshan and return immediately. They started at 6 P.M and reached in five hours. They saw a long queue waiting for darshan and when they asked around, they were told that the people standing in the queue could have darshan only in the morning. Thinking that it was not possible for them to have darshan they decided to just do as Panditji had told as there was nothing to lose. By 1.30 A.M, after they had waited in the queue for over two hours, a miracle took place. A temple staff clad in uniform arrived, started dragging a few people from the crowd wordlessly. He dragged one of the Malaysian clients and after giving a gap he dragged another person who happened to be our next person from Malaysia. Similarly he picked out six people and told them to follow him to the inner shrine. Taking them to the money counting place of the temple, he made them sit and count some money to conclude that days collection. After they were done, all the six of them were taken to the sanctorum of God Balaji, shown aarti and given two big laddus and vadas as Prasad for their service. Later, they came to know that it is a practice in the temple that every night the total Hundi amount collection will be told to the Lord and aarti would be shown for the last set of people who does the counting. By 1.50 A.M both these people had come out of the shrine with Prasad in their hands without even paying anything to buy the same. Tears of joy rolled out of their eyes and they decided to offer their hair to God Balaji. Taking a bath, they started their journey to Madras. As their luggage were already packed, they checked out of their rooms and on their way to the airport, they visited our house. Giving a laddu, they narrated about their wonderful darshan they had because of Paditji’s blessings and flew back to Malaysia. The simple question they asked Panditji was, how he knew that they had to start by 6 P.M and that they had to stand separately with a gap of 20 people and how did the temple authority selected him and also his friend among the people in that big queue?